UPS PIco HV3.0 A HAT Stack 450 Plus is an advanced uninterruptible power supply for the Raspberry Pi A+/B+/2/3, that adds a wealth of innovative power back-up functionality and development features to the innovative microcomputer! The UPS PIco will automatically shut-down your Raspberry Pi if there is a power failure, and can be set to automatically monitor and reboot your Pi once power has been restored! The UPS PIco HV3.0A HAT Stack 450 Plus version features a 5V 3A output, designed for use on the latest Raspberry Pi 3! Extended Voltage Input 7 – 28V DC – Protected with Zero Voltage Drop Inverse Polarity Protection, PPTC Over-current, and ESD. Ideal for Cars, Trucks, Buses and any industrial high voltage applications. Dynamic Power Tracking (DPT) – Charges the battery according to available input power from 100 mA – 1200 mA. DPT checks the input current every second, and adjusts the charging current based on this value making it ideal for Solar Panel applications. The UPS PIco is equipped with a 450mAh LiPO battery specially designed to enable safe shutdown during a power cut. Additionally, this can be easily upgraded to the extended 4000mAh or 8000mAh versions, which enables prolonged use of a Raspberry Pi for up to 16 hours without a power supply connected! The UPS PIco features an embedded measurement system that continuously checks the powering voltage of the Raspberry Pi. When the cable power on the Raspberry Pi is absent, insufficient, or the device detects a power failure, the UPS Pico automatically switches to the unit’s battery source. The module then continues to check the voltage on the Pi and switches automatically back to the regular cable supply when power is once again available. The UPS PIco is powered and the battery pack intelligently charged via the GPIO pins on the Raspberry Pi, so no additional cabling or power supply is required. Because the UPS Pico requires no external powering and fits within the footprint of the Raspberry Pi, it is compatible with most cases. The UPS PIco can also be equipped with an optional Infra-Red Receiver which is routed directly to GPIO18 via the PCB for remote IR operations. 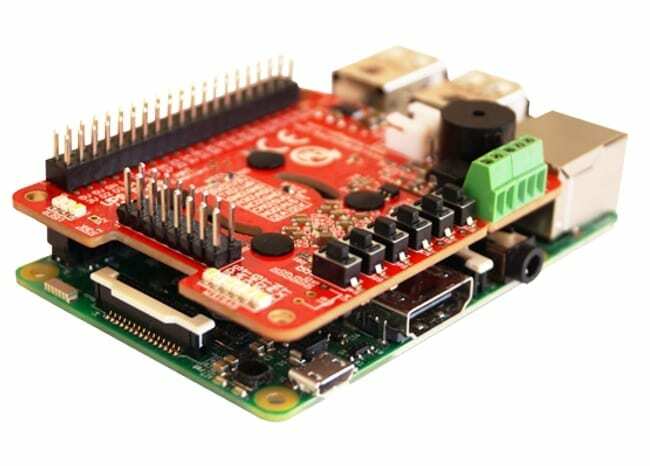 Additionally the PIco includes an Automatic Temperature Control PWM FAN controller, and can be equipped with a Micro Fan Kit, which enables the use of the Raspberry Pi in extreme conditions including very high temperature environments. The UPS PIco is designed to be 100% compliant with HAT standards for the Raspberry Pi and includes a Gold Plated Reset Pin, with install locations for the Raspberry Pi Zero, B+/2 and 3. 5V 3A Power Backup for even the most demanding Pi 3 set ups. Dynamic Power Tracking (DPT); charges the battery according to available input power from 100 mA – 1200 mA. DPT checsk the input current every second, and adjusts the charging current based on this value making it ideal for Solar Panel applications. 4000mAh, 8000mAh or 12000mAh batteries; available for up to 32 Hours Run-Time. Battery Packs include mounting base. The UPS PIco HV3.0B HAT Stack Plus with Battery 450 is an advanced Intelligent Mobile Power Bank and Uninterruptible Power Supply for the Raspberry Pi® A+/B+/2/3 and ZERO/W, that adds a wealth of innovative powering/backup functionality and development features to the innovative microcomputer! The UPS PIco HV3.0B HAT Stack Plus with Battery 450 will automatically shut-down your Raspberry Pi® if there is a power failure, supply mobile applications from battery source, and can be set to automatically monitor and reboot your Raspberry Pi® once power has been restored! If used as Mobile Power Bank it is equipped also with an Intelligent Externally Accessed (with Files Safe Shutdown functionality) Power Slide Switch that allows to safety System Switch ON/OFF whenever you like, without worrying about files corruption as it is always properly shutdown the system before battery will be disconnected (keep battery connected until system shutdown)! The UPS PIco HV3.0B HAT Stack Plus with Battery 450 features a 5V 3A total current output on battery powering, designed for use on the latest Raspberry Pi® 3 as also former Raspberry Pi® modules! UPS PIco HV3.0B HAT Stack Plus with Battery 450 offers now 3 User Programmable Keys, 3 separate User programable LEDs with different colors, support for multiple and different chemistry of a high capacity batteries, bi-stable relay (Zero Power) configured as DPDT or SPDT, as also 3 x A/D 12-bit converters with pre-adjustable readings to 5.2V. As also 10V, 20V and 30V voltage conversion (when used with Terminal Blocks PCB or separate external resistors). Now, with number of embedded sensors (inbound current, outbound current, temperature, voltages), true 5V 1-wire interface, optional high voltage RS232 interface and many, many additional features!! The UPS PIco HV3.0B HAT Stack Plus is standard equipped with a 450mAh 15C LiPO battery (able to supply up to 6.5A) specially designed to enable safe shutdown when cable power cuts. Additionally, this can be easily upgraded to the extended 1500mAh, 4000mAh, 8000mAh or even 12000mAh (on Special Order) capacities, which enables prolonged use of a Raspberry Pi for more than 24 hours without a power supply connected! The UPS PIco HV3.0B HAT Stack Plus with Battery 450 design support now batteries with different chemistry like: LiPO, Li-Ion as also LiFePO4. Especially the LiFePO4 batteries are addressed to applications where temperatures environment is more restricted as can be used for supplying from –10 degrees up to +60 degrees. In addition, the LiFePO4 have a unique extremely long life of charging/discharging that can achieve up to 2000 cycles or 10 years life time!! Now, with new add-on board (PIco LP/LF Li-Ion 18650 Battery Holder) you can use all Li-Ion 18650 batteries from electronic cigarettes wide available on the local markets approaching total capacity of 7200mAh, as also 18650 LiPO and LiPo4Fe (called also 123). With additional External Supply Powering Input; that has implemented Dynamic Power Tracking (based on Voltage Proportional Charge Control – especially designed for Solar Cells); automatically adjust battery charging current according to power availability from 100mA – 800 mAh, in order to use all available energy from the Solar Panel in case of use. This feature has been especially designed to support Solar Panel Powering Raspberry Pi® Systems, as it is adjusting the charging battery current to available Sunning conditions, which is varring. The External Supply Powering Input is able to accept power from 7 V DC up to 28 V DC!! Thus, make it ideal for Cars, Trucks, Buses and any industrial applications where voltage is usually higher than 24V DC. The External Supply Powering Input is equipped with Over Current protection, Over Voltage protection, ESD protection as also with Zero Voltage Drop Inverse Polarity Protection protecting Raspberry Pi® System from improper usage, but also offers, due to zero voltage drop, usage of most of available energy from the Solar Panel in case of use. The UPS PIco HV3.0B HAT Stack Plus with Battery 450 is powered and the Battery Pack intelligently charged via the GPIO pins on the Raspberry Pi®, therefore no additional cabling or power supply is required (if used Raspberry Pi® PSU 5V supply). Due to that fact UPS PIco HV3.0B HAT Stack Plus with Battery 450 requires no external cable powering and fits within the footprint of the Raspberry Pi®, it is compatible with most cases. If powered via External Power Input (7V-28VDC) the there are cases available to hold your designed system. Also, in case the UPS PIco HV3.0B HAT Stack Plus with Battery 450 is powered from the Extended Power Input, it allows to charge the battery even if Raspberry Pi® is not powered. Thus, functionality in combination with Events Scheduler make the system always full of energy when needed to be running. Professional developers often need to protect their application. To support them UPS PIco HV3.0B HAT Stack Plus with Battery 450 offers the XTEA dual path encryption engine that protect the developed software with the secure code. The new PCB is designed with 2 oz copper and 4 layers, especially for high current powering systems offering Multilayer Copper Thermal Pipes for increased System Thermal Response and better passive cooling!! 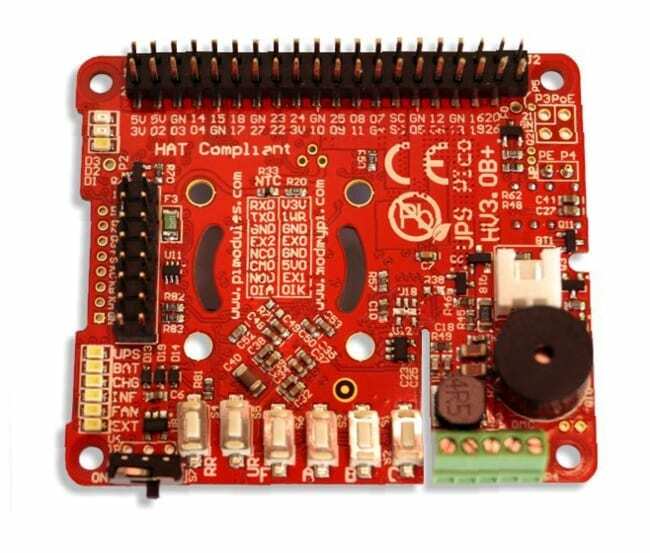 The PIco HV3.0B HAT Plus 450 can also be equipped with an optional Infra-Red Receiver which is routed directly to GPIO18. The embedded Electromagnetic Programmable Sounder can be used as a simple buzzer but also as music player due to implemented sound generator and dedicated programmer interface. The IoT developers will find useful the 3 independent ESD protected 12 bits buffered A/D converters as also number of internal sensors and sensor interfaces that can be used for system monitoring such as Battery Voltage, Raspberry Pi Voltage, Inbound/Outbound Current measure, System Temperature and true 5V 1-wire interface. The integrated Hardware RTCC enables a new extremely usefully feature – the Events Triggered RTCC Based System Actions Scheduler. The Events Triggered RTCC Based System Actions Scheduler allows to timely start up, or shutdown the Raspberry Pi® on various internal or external events that include, data available on RS232, A/D, RTCC, and temperature, or just on requested Time Stamp. Finally, the UPS PIco HV3.0B HAT Stack Plus with Battery 450 features an implemented Automatic Temperature Control PWM FAN controller, and can be equipped with a micro fan kit, which enables the use of the Raspberry Pi® in extreme conditions including very high temperature environments. The FAN speed can be manually/automatically adjusted according to system temperature conditions linear from 0 % (FAN is OFF) up to 100% by increasing and decreasing rotation speed. Thus, guarantees the possible lowest level of noise and always cool Raspberry Pi® 3. Designed and Manufactured in Europe. The UPS PIco HV3.0B+ HAT Advanced 450 is an advanced Intelligent Mobile Power Bank and Uninterruptible Power Supply especially designed for the Raspberry Pi® 3 Model B+, that adds a wealth of innovative powering/backup functionality and development features to the innovative microcomputer! The UPS PIco HV3.0B+ HAT Advanced 450 will automatically shut-down your Raspberry Pi® if there is a power failure, supply mobile applications from battery source, and can be set to automatically monitor and reboot your Raspberry Pi® once power has been restored! It is equipped also with an Intelligent Externally Accessed (with Files Safe Shutdown) Slide Power Switch that allows to safety System Switch ON/OFF whenever you like, without worrying about files corruption as it is always properly shutdown the system before cable power will be disconnected. This new and very advanced feature, switches OFF also the Raspberry Pi® 3 Model B+ even if it is powered via their micro USB powering cable. This allows also to charge (optionally) the battery when Raspberry Pi® 3 Model B+ is OFF however still connected to the micro USB cable powering source. If used as Mobile Power Bank it is equipped with an Intelligent Externally Accessed (with Files Safe Shutdown functionality) Power Slide Switch that allows to safety System Switch ON/OFF whenever you like, without worrying about files corruption as it is always properly shutdown the system before battery will be disconnected (keep battery connected until system shutdown)! The UPS PIco HV3.0B+ HAT Advanced 450 features a 5V 3A total current output on battery powering, designed for use on the latest Raspberry Pi® 3 Model B+. UPS PIco HV3.0B+ HAT Advanced 450 offers now 3 User Programmable Keys, 3 separate User programable LEDs with different colors, support for multiple and different chemistry of a high capacity batteries, bi-stable relay (latching, Zero Power) configured as 2 Amp DPDT, as also 3 x A/D 12-bit converters with pre-adjustable readings to 5.2V. As also 10V, 20V and 30V voltage conversion (when used with Terminal Blocks PCB or separate external resistors). Now, with number of embedded sensors (inbound current, outbound current, temperature, voltages), true 5V 1-wire interface, optional high voltage RS232 interface and many, many additional features!! The UPS PIco HV3.0B+ HAT Advanced 450 is standard equipped with a 450mAh 15C LiPO battery (able to supply up to 6.5A) specially designed to enable safe shutdown when cable power cuts. Additionally, this can be easily upgraded to the extended 1500mAh, 4000mAh, 8000mAh or even 10400mAh (on Special Order) capacities, which enables prolonged use of a Raspberry Pi for more than 24 hours without a power supply connected! The UPS PIco HV3.0B+ HAT Advanced 450 design support now batteries with different chemistry like: LiPO, Li-Ion as also LiFePO4. Especially the LiFePO4 batteries are addressed to applications where temperatures environment is more restricted as can be used for supplying from –10 degrees up to +60 degrees. In addition, the LiFePO4 have a unique extremely long life of charging/discharging that can achieve up to 2000 cycles or 10 years life time!! The UPS PIco HV3.0B+ HAT Advanced 450 is powered and the Battery Pack intelligently charged via the GPIO pins on the Raspberry Pi®, therefore no additional cabling or power supply is required (if used Raspberry Pi® PSU 5V supply). Due to that fact UPS PIco HV3.0B+ HAT Advanced 450 requires no external cable powering and fits within the footprint of the Raspberry Pi®, it is compatible with most cases. If powered via External Power Input (7V-28VDC) the there are cases available to hold your designed system. Also, in case the UPS PIco HV3.0B+ HAT Advanced 450 is powered from the Extended Power Input, it allows to charge the battery even if Raspberry Pi® is not powered. Thus, functionality in combination with Events Scheduler make the system always full of energy when needed to be running. Professional developers often need to protect their application. To support them UPS PIco HV3.0B+ HAT Advanced 450 offers the XTEA dual path encryption engine that protect the developed software with the secure code. The UPS PIco HV3.0B+ HAT Advanced 450 can also be equipped with an optional Infra-Red Receiver which is routed directly to GPIO18. Finally, the UPS PIco HV3.0B+ HAT Advanced 450 features an implemented Automatic Temperature Control PWM FAN controller, and can be equipped with a micro fan kit, which enables the use of the Raspberry Pi® in extreme conditions including very high temperature environments. The FAN speed can be manually/automatically adjusted according to system temperature conditions linear from 0 % (FAN is OFF) up to 100% by increasing and decreasing rotation speed. 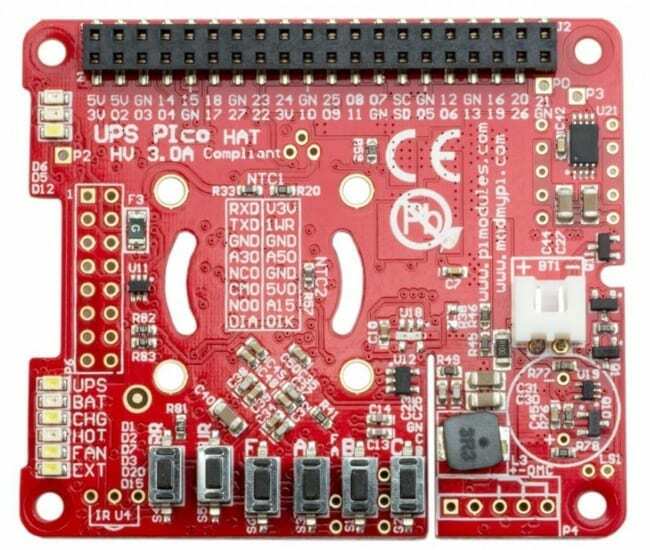 Thus, guarantees the possible lowest level of noise and always cool Raspberry Pi® 3 Model B+. Designed and Manufactured in Europe.